It's a beautiful spring weekend and I want to make something fresh and lighter in calories but still delightfully comforting when I zap the leftovers for lunch between classes this week. This stew is very much hitting the spot. I was going to top it with biscuits, but I had these beautiful gold potatoes I needed to use up. I've indulged in the pesto bruschetta one too many times in the last month! The pesto is addictive and good bread is so hard to stop eating...oy. Anyway, it's time to double up on the veggies and the veggies are beautiful right now! 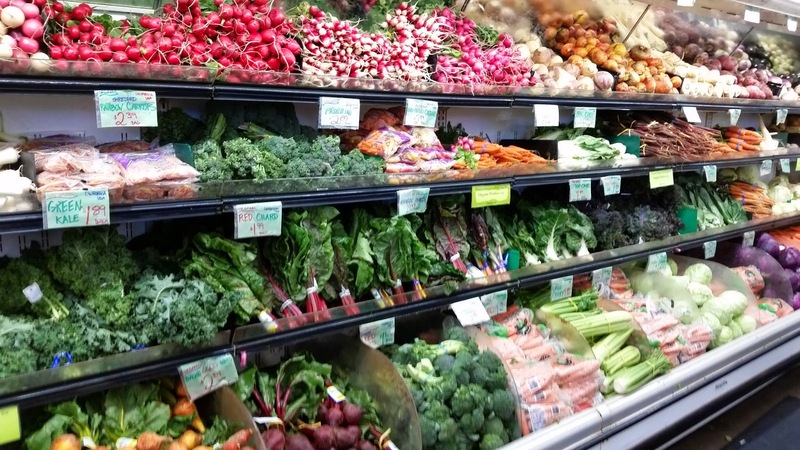 This is just a quarter of the organic section of the legendary Berkeley Bowl, where there is so much produce in the regular section that you can smell the perfume of whatever is in season. Alas, carrots and radishes aren't so great while recovering from dental work, but I'll be back at those later in the week. Some would call this dish a pot pie, and it's that type of delicious. 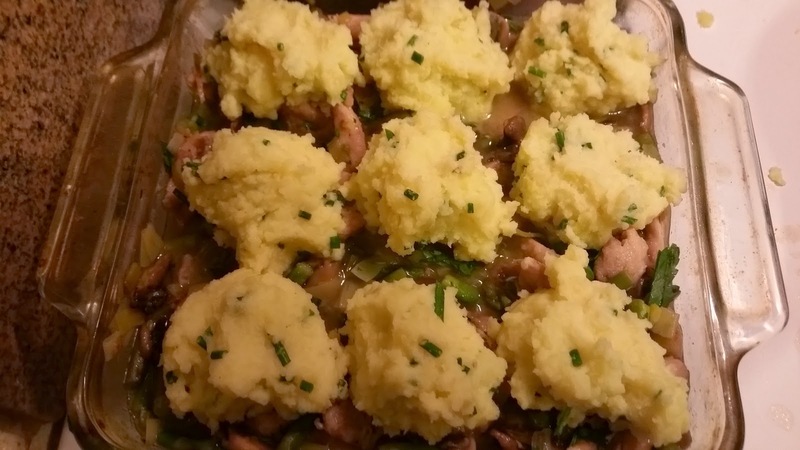 The use of mushrooms and asparagus instead of peas and potatoes lightens it up (as does not going overboard on butter in the potatoes). To make it vegetarian, you could skip the chicken and add white beans to the sauteed vegetables. 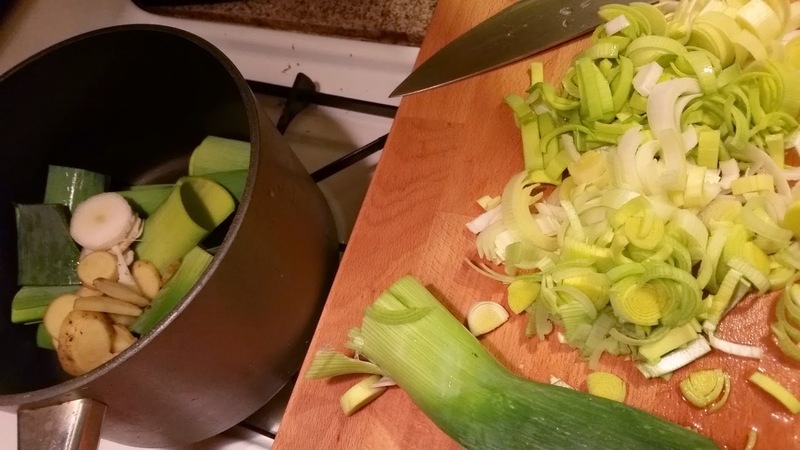 Wash and pat dry 2 smallish leeks and 3/4 lb each gold potatoes, asparagus and mushrooms. Different people have different ideas about how to clean mushrooms. Some say to just brush them, but I'm in the Jacques Pepin camp. "Of course you wash them. They're dirty!" 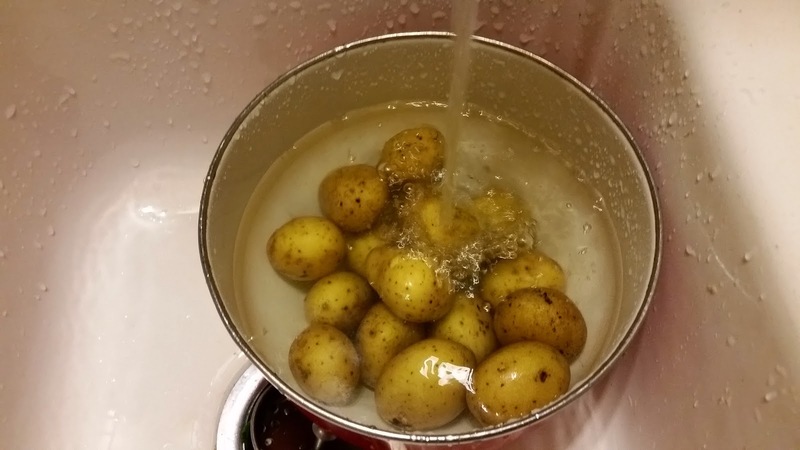 Don't use vegetable soap, and don't let them sit in the water or they'll soak too much of it up. Vegetarians, avert your eyes and scroll down 2 pics. 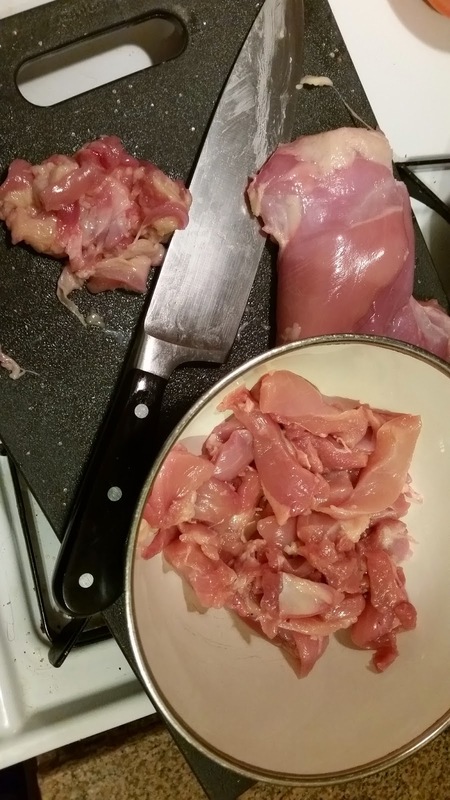 Cut 1 to 1.25 pounds boneless, skinless chicken thighs (or breast, but thighs are tastier) into slightly larger than bite-size pieces, removing any gristle or tendony bits. Sprinkle the pieces with salt, pepper and a tablespoon of flour or cornstarch. Wash the knife and change to a clean cutting board before cutting the veg. Heat 1.5 Tbsp olive oil in a not-nonstick pan over medium high. If you only have non-stick, that'll do too, but you'll probably get less browning. Also, if you use non-stick, be careful to use plastic or silicone tools! When it's good and hot, put the chicken in the pan so the pieces aren't touching and quickly brown on at least two sides. If they're touching, they'll steam before they brown. Depending on the size of your pan, you might have to do this in two batches. If you're really in a hurry, use two pans. I pushed it a little this time, so the 12 in. pan was a touch crowded and not quite hot enough. They didn't brown evenly, but it's ok, just not quite as flavorful as it could be. Try not to cook the chicken all the way through yet. 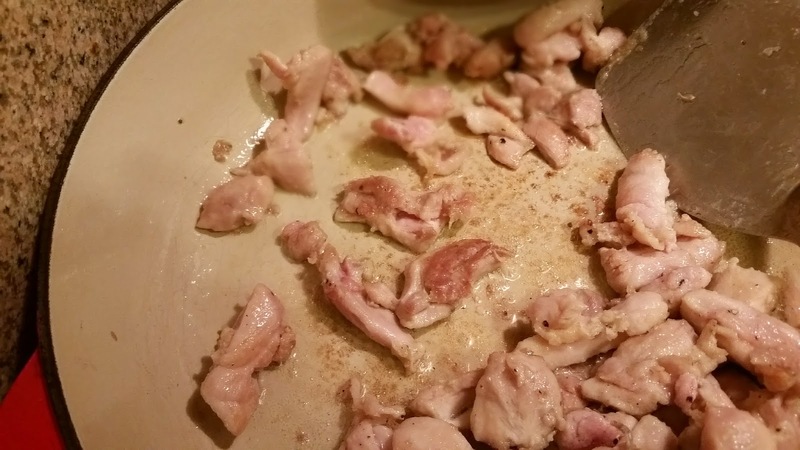 Remove the chicken from the pan and set aside in a bowl. Don't wipe out the pan unless you've burnt something. Use all the little brown bits for flavor. OK, vegetarians, you can tune back in now. Add leeks to the pan with 1 tsp more olive oil and saute over medium until soft, about 5 minutes. Don't brown them! Clean and slice the mushrooms while the leeks soften. Push to the side of the pan and start adding 1 lb sliced mushrooms. As far as cooking mushrooms goes, some will insist that you must put a tiny amount of mushroom slices at a time into the pan until each slice releases enough of its juices to turn a deep brown. This is kind of relaxing if you've got all day, kind of exhausting if you don't. Some just dump them all into the pan at once, because this way, they release their juices into the stew. This is still tasty, but doesn't quite have as much depth of flavor. I tend to land somewhere in the middle. If I have time, I'll do them in medium batches, pushing the brownish ones to the side to keep cooking together. If not, in they all go! This time I didn't quite cook them long enough, so there was too much liquid in the pan. 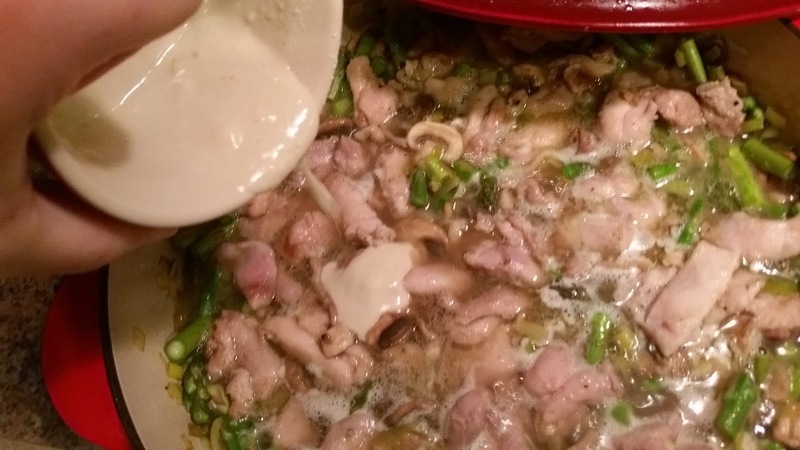 If the brownish stuff on the bottom of the pan starts to look too brown during this stage, add a little of the 1/2 cup dry white wine or 1 cup chicken broth early. When the mushrooms have cooked down quite a bit, 5 minutes or more, add the chicken back to the pan with 1/2 cup white wine. Stir everything around, scraping up any brownish bits from the bottom of the pan. Let cook a few minutes until the wine reduces a touch. While the wine reduces, remove the tough bottom parts of the asparagus spears by bending each piece until it breaks naturally. 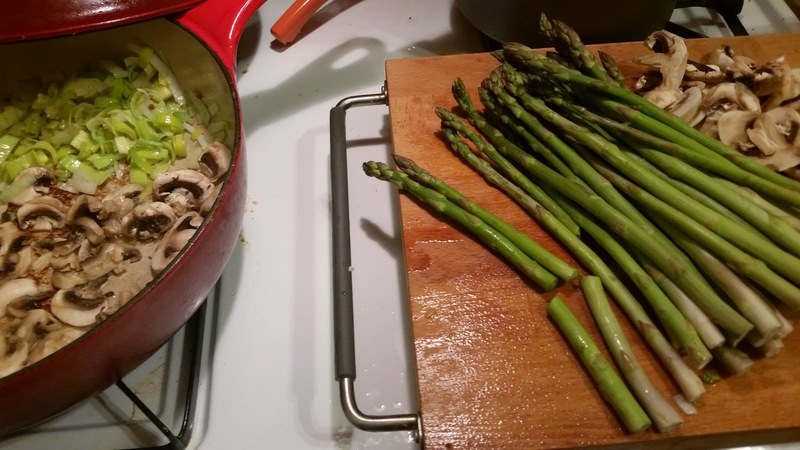 Wash the asparagus and cut into pieces or slices. 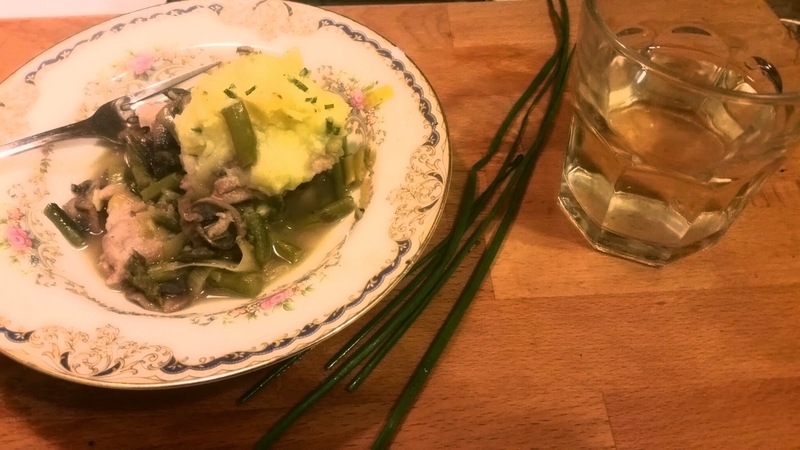 When the wine has reduced, add the asparagus and cook for about a minute, then add 1 cup chicken or vegetable broth. Simmer for about 5 more minutes, then put 2 Tbsps of the hot broth into a cup with 2 more tablespoons flour or cornstarch. Mix well and put back into the pot. Stir and cook one or two more minutes, then turn off heat. Taste for salt and pepper. Stir in 1-2 Tbsp minced parsley if you like, or a little lemon zest. 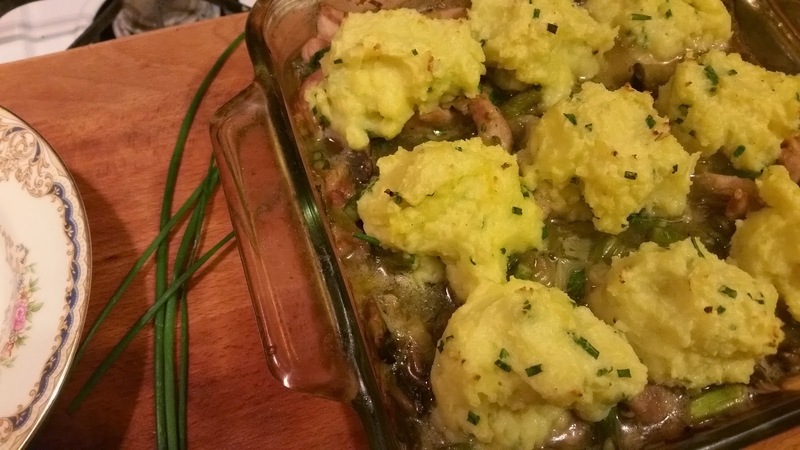 You can eat the stew just as is, or top it with mashed potatoes! If doing the potatoes, preheat the oven to 400. Peel the potatoes, reserving the nice bits of the peels with the asparagus stems and leek greens for tomorrow's broth. Boil until fork tender and drain. 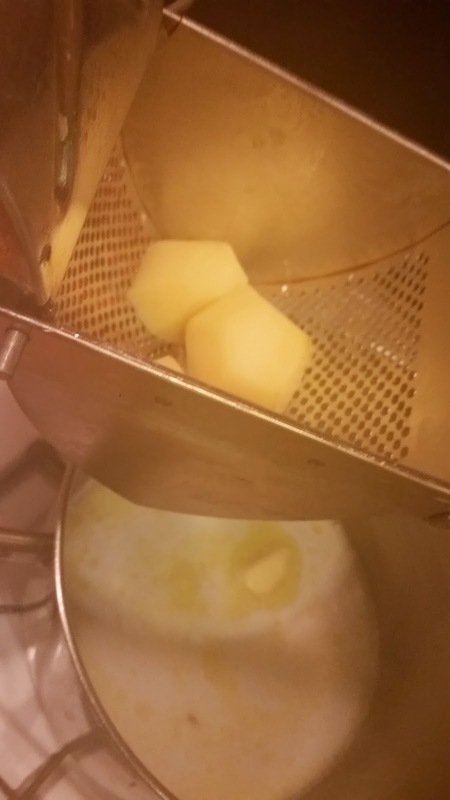 Warm 1 Tbsp butter and 1/3 cup milk in a pot, then mash the potatoes in the pot with the butter and milk. I got fancy and dug out my ricer 'cause it makes fluffy potatoes. Add a little more milk if it needs it, and stir in 1-2 Tbsp snipped fresh chives. Pour the stew into a 9 x 9 x 2 in. pan and scoop the mashed potatoes on top with an ice cream scoop. You could spread it, too, but the scoops help me with portion control! Bake in a 400 degree oven for about 15 minutes, until the potatoes get golden bits on top. 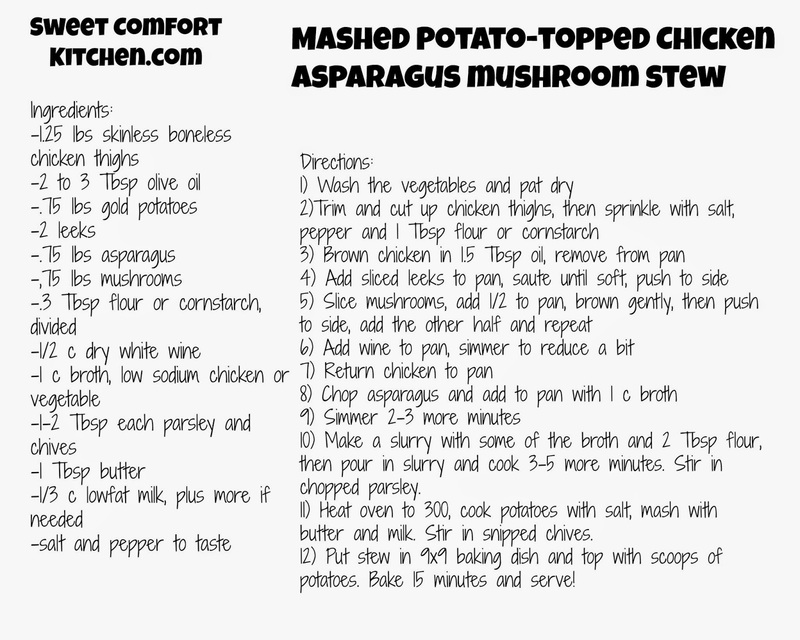 To print recipe card (8x10), right click on image to save. Print from your hard drive.